Are Sea Squirts Crowding Out Scallops? 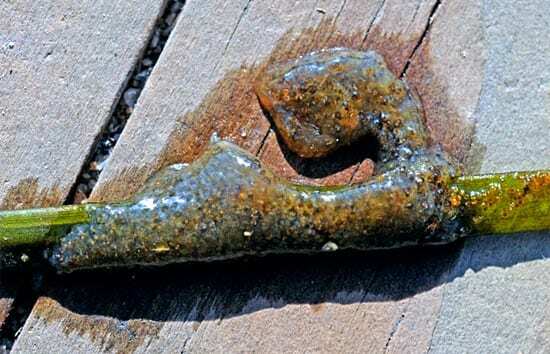 Over the last 10 years, Mary Carman has documented how slimy sea squirts have invaded coastal New England, multiplying on rocks, docks, boat bottoms, moorings, and other hard surfaces. Their rubbery bodies create a nuisance and, perhaps more importantly, render some areas uninhabitable for native species of oysters, mussels, scallops, and other marine life. Until this summer, Carman had only rarely seen the creatures anchoring themselves to softer structures. So she did a double take when she spotted two sea squirts that she studies, known to scientists as Didemnum vexillum and Diplosoma listerianum, clinging to acres of underwater eelgrass. The thick, waving meadows of eelgrass provide crucial nurseries for sea life, and are a prime habitat for prized shellfish—bay scallops. 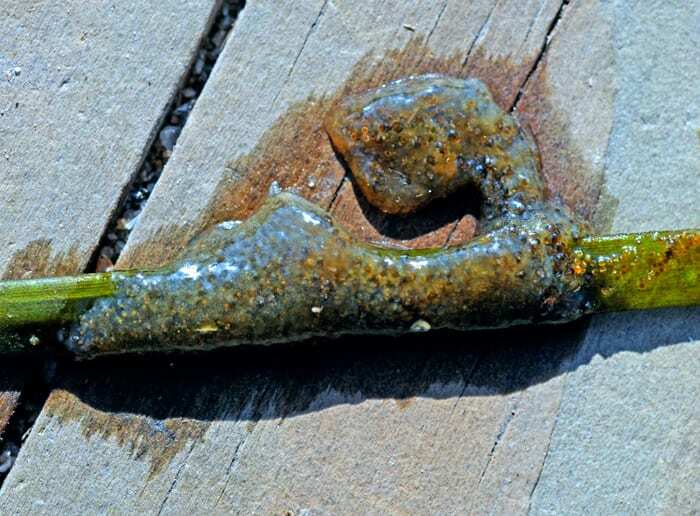 Carman, a researcher at Woods Hole Oceanographic Institution, found sea squirts coating eelgrass in Sengekontacket Pond and Lake Tashmoo on Martha’s Vineyard, Mass. 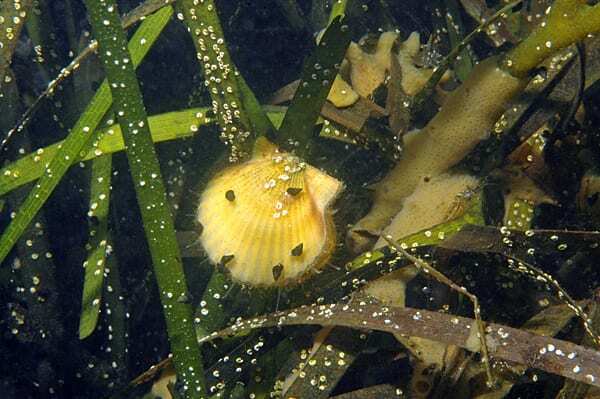 Under ordinary circumstances, juvenile scallops dangle from eelgrass blades like holiday ornaments, until they grow big enough to release their hold and then swim freely or rest in sediments. But in these spots at least, sea squirts were moving into the scallops’ neighborhood. Was this the first hint of a trend? Alarmed at the possibility, Carman contacted David Grunden, the shellfish constable in the island’s town of Oak Bluffs. Martha’s Vineyard shellfish fisheries are so important to the resort island off Cape Cod that each town has a shellfish constable. Locals sometimes jokingly call them “clam cops” and “shellfish sheriffs, ” but jobs like Grunden’s are serious—looking after bay scallops, oysters, clams, and other marine life that live in one of the nation’s most productive shellfish regions. Though small in size, coastal Massachusetts is one of the top 10 producers of shellfish in the United States. Bay scallops have been important to its residents since colonial times, when settlers picked the shellfish by hand at low tide. At peaks in the 1980s, the state harvest exceeded 1,200 metric tons and was valued at $11 million. On Martha’s Vineyard, where people flock for summer vacations fueled by plates of fresh, garlic-and-butter-infused seafood, bay scallops remain ingrained in the island’s culture. Since the 1980s, bay scallops—a species with a lifespan of just two years—have been in decline. Research suggests that an increase in nutrients (in the form of fertilizers and sewage from septic systems) that have flowed into coastal waters has spurred rampant growth of marine algae. This diminishes water quality and blankets the water surface, blocking sunlight from penetrating to eelgrass. An influx of sea squirts could make it even harder for bay scallop populations to survive. One sunny Thursday morning before Labor Day weekend, Carman, Grunden, and several volunteers—including a concerned local fisherman, an underwater photographer, and Carman’s high-school-age daughter—motored into Major’s Cove in Sengekontacket Pond. Wearing snorkeling gear, they jumped overboard to find out just how much of the five-acre eelgrass meadow had been overtaken by sea squirts. After diving about eight feet to the mucky bottom, Carman surfaced and gently spread several slender, bright green strands on the boat’s deck. Most of the blades were coated at least partially with sea squirts. They looked like rotten scrambled eggs and felt cold and slippery to the touch. “Look how it is growing right next to the scallop,” she said, gesturing to a thumbnail-size shell attached to the plant. During the next two hours, she and the volunteers swam over the meadows, taking samples and marking locations using a handheld GPS unit. Carman’s single-minded dedication to learning, and teaching others, about sea squirts began 10 years ago when she was a naturalist who coordinated youth education programs. To answer her students’ questions about the weird-looking, rubbery creature (which some kids called “alien vomit”), she began doing research. She quickly found no ready answers. Since then she has acquired grants and a place in the WHOI Geology and Geophysics Department. 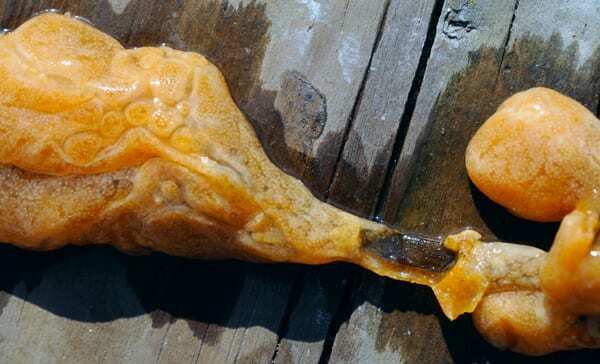 Of the nine types of sea squirts found on Cape Cod, six are invasive species introduced in the last 80 years from Asia and Europe. Carman’s research focuses on a species of the genus Didemnum, which forms dense mats from many small, linked individuals. The creatures take over new areas in several ways, some traveling in from affected areas by clinging to boat bottoms or aquaculture gear, others by simply traveling from place to place by clinging to a piece of wood, a plastic bottle, or a blade of eelgrass. On Martha’s Vineyard, with many connected waterways, Carman said it’s easy to imagine how easily they could move and settle into new areas. “Everywhere I go on the Cape, I’m looking for them,” she said. Her daughter Mimi has been helping look for squirts since kindergarten. Now 16, she joins her mother on snorkeling excursions and can identify native and non-native sea squirts at a glance. 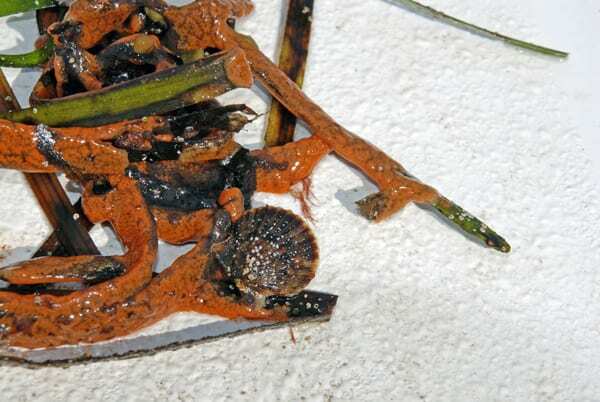 Of their growth on Martha’s Vineyard, Carman said, “I’ve never see them in an open area like this and not to this extent.” In late September, she attended a workshop on aquatic invasive species where she confirmed with colleagues that Didemnum vexillum and Diplosoma listerianum have not been previously documented growing on eelgrass. So far, Grunden said, sea squirts have not had a direct, negative impact on wild populations of bay scallops or on other shellfish that use eelgrass for habitat, such as oysters, quahogs, or clams. However, they are a nuisance to those in the aquaculture industry. They cling to aquaculture equipment, including cages used to encourage bay scallop spawning each year in several ponds on Martha’s Vineyard. “Oyster farmers find Didemnumto be a pest species that impedes the flow of food and water, are time-consuming to remove, unsightly, and generally just a headache to deal with,” said Diane Murphy, who works with shellfish growers on Cape Cod and Martha’s Vineyard in her job with Cape Cod Cooperative Extension. Fishermen also want to see less of them. Jeff Clements, a commercial shellfisherman in New England for 35 years, volunteered the use of his boat and time before Labor Day to help Carman’s research. Funding for Mary Carman’s research came from the Sailors’ Snug Harbor of Boston Foundation and the Link Foundation. An example of Didemnum vexillum, which Mary Carman found clinging to eelgrass in water bodies on Martha's Vineyard. An example of Diplosoma listerianum, which Carman also found attached to eelgrass.